Blog » How to Setup Roku Device on Your TV? Advancements in technology have ensured everyone and anyone can access all multimedia websites or channels for entertainment purposes. The Roku 3 is the child of this initiative and with its improved internet connectivity and easy installation, you will enjoy what the Roku team has to offer. Just as its previous predecessors, the Roku 3 is a media hub that will satisfy ones needs when it comes to multimedia streaming; watching online videos, downloading and streaming music and generally running peer to peer connections within one’s home. This is as a result of the newly added internet connectivity feature that is sure to make every owner move to the edge of their seats. In this post, we will learn on how to Setup Roku Device on Your TV? Media sites like Youtube, Spotify, Amazon, Showmax, etc. have become “global villages” of some sorts since Roku 3 owner is assured efficient, fast and yet simple media tool for all to use. As for all informative pieces you will find that the bullets below will provide with the much needed no how to successfully install your new Roku 3 devices and ensure you get you value for your money, as all Roku Devices. If you have considered buying the Roku 3, having an internet connection is key to ensure you devices works to its full potential. Internet installation is now a cheap affair and having it in your household or office is not a daunting task as before. This will involve the use of a HDMI cable. Since the phasing out of the three on three media cables that old devices had (Composite Cables), the Roku 3 has a HDMI mother port to allow connections to your display devices. HDMI cables can be easily found in most electronic shops for not more than 10 USD, depending on the make and model. In cases where one has no access to any HDMI cables, using converter boxes can also do the job perfectly. Get an HDMI Cable: We have mentioned earlier that the Roku 3 connects only with HDMI enabled devices and it is a real bummer that one doesn’t come with the Roku 3. However, that is not much of a problem, as you can easily pick one at the nearest local electronics or order one online. Okay, maybe we have to mention that if you happen to have an older version of the Roku player, a standard composite cable will suffice. Locate the HDMI port on the Roku 3 and plug the HDMI in. Then, plug the other end of the cable into the HDMI port which is usually located at the back of the TV. Now that the Roku 3 and the TV are connected, the next point of call is to connect the Roku device to a power source. Grab the power cable contained in the box and plug the small jack into the appropriate power slot in the device. 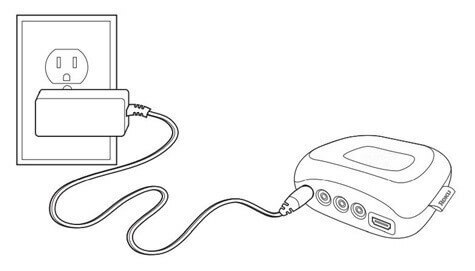 Then connect the power adapter into a power outlet on a wall or wherever it is available. As the Roku 3 is internet enabled, one can easily connect them using Ethernet cables. Please note that the cables are sold out separately from the device and can be bought. In case where you use Wi-Fi, there are rechargeable Wi-Fi sticks that can be found on amazon and once plugged in into the Ethernet port behind the device, you will be able to access all media platforms of your choice. If indeed you have an Ethernet cable, make sure to plug in the cable to the Roku 3 and the other to the gateway/router or switch depending in your internet setup. Once your TV set and the Roku are connected, the next step is sourcing for power. Roku devices come with their own adapter cables in the packaging. The adapter come with in-built fuses to mitigate against brownouts or power shortages. Source for any preferred power outlet and connect your device to enable powering on/off. 2. Powering on the Device. Once the device is powered on, you will have to choose the source input from your TV i.e. if you had used you HDMI as your preferred cable then logically you will have to choose HDMI as the source input. In cases where you had used the Composite cables, make sure to have the input choice as the cables to enable video and audio through the TV. The default language preferences on Roku Devices in English, depending on where it was shipped to. In instances where you opt to communicate with the device in another language, a prompt message will appear once it’s powered on and from there you can easily choose your preferred language. This does not mean it will be their forever as one can edit the settings in the Settings options on your Account Tab. This is the first step in setup Roku Device on Your TV. To keep up with the ever changing internet requirements, Roku rolls out device updates from time to time. One should be connected to the internet to enable this. Upon powering up, the device will display a list of all available networks. Choose the preferred network and enter the necessary access codes. Once done the device will validate the connections and check for any available updates. Before anyone can access the streaming services provided by Roku, you will have to set up your account information. It is advisable to use a valid email address to allow you to get all notifications, news and updates. Using a strong password is also best practice when opening up and setting up any account across Roku Streaming devices. Once can also go to the link, my.roku.com/signup, to setup their account before purchasing their new devices. Alternatively, you can contact us on our Roku customer Technical Support Number for setup and any Roku related help. If you have an existing Roku Account, you will be able to link it during powering on as you set your device preferences i.e. language and network choice. Your Roku player must be linked to a Roku account before it can be activated. What your Roku does is to keep a log of which Roku devices you won and allows you to find and add free and purchased channels from the Roku Channel Store. Please, be aware that to open a Roku account is entirely free. A common question that is usually asked is how can one maintain or keep track of all subscriptions to all channels without having to do it channel by channel. Roku has solved this with the Roku Channel Store. Once your account is linked to the Channel Store, you can manage all your subscriptions in one place regardless of the channel under your account information. This payment method is efficient to all Roku users as adding and cancelling subscriptions can be done either through Roku Streaming Devices, your Roku Account or the Roku Website. In cases where users have encountered problems during and after installation, the Roku team is readily available to service any requests, orders or questions you might have. I hope this post helped you Setup Roku Device on Your TV.